All quiet on the Italian front: or being in the silent phase of learning a second language. With help from Renato Carosone, Yolanda Be Cool, Carosones, Sophia Loren, Clark Gable and Kraftwerk!! Chi te li dà? La borsetta di mammà! Where are the luggage carts? Why is there a delay? A double room with a shower, please. Is the coffee hot? No, it’s cold. These were the first phrases I learned in Czech. Unfortunately I’ve only ever had to use them once in a real-life situation, when I was stuck on a London Underground train on the way to the theatre. A Czech couple next to me were getting very agitated (maybe, like me, they were on the way to see Jesus Christ Superstar and didn’t want to miss a second.) I thought I’d help them relax by signaling to them that I knew something of their beautiful language. Proč je tam zpoždění? I proffered. (Why is there a delay?) Hleď si svýho! was their riposte. I wasn’t sure what that meant, so automatically unloaded my set of Czech phrases onto them. I thought it would make them laugh, but maybe their urge to see the New Testament turned into an all-singing, all-dancing rock extravaganza was greater than mine, because they leapt up and moved to the other end of the carriage, shouting Sra Ãška and jít k čertu and something that sounded like jdi do pekla. I’ve since learned that the only way to learn a new language to any degree of fluency is to be immersed in it. I’m being immersed in French at the moment, but it’s exhausting! The word immersion always reminds me of those baptism ceremonies where you dress all in white and a pastor grabs you by the head and holds it under the water while he says something from scripture. Only with being immersed in French, it’s like the pastor has got carried away with reading the Bible and forgets to let go of your head. After 15 minutes of being involved in conversation, or listening to people talking 10 to the dozen, I feel that my head is swimming. I desperately want to rush outside for a gasp of fresh air, and silence. Talking one-on-one is not the issue, as both people can find a way of tuning into each other, but trying to say something in French in front of a group can be nerve-wracking. Some people will tell you that it’s good to suffer. Personally I don’t like it, but it does help me to gain an insight into how we can positively help children learn a second language, how it must feel to struggle with language learning in public, and how to help children who are bilingual learners and very shy. It’s well known that many children and adults go through a silent phase when they are in the early stages of being immersed in the language. I describe this as being an active phase, where you are trying to work out when one word ends and the next one begins, and trying to make sense out of key words that you hear repeatedly as people are talking to each other. If you have never been in the situation where you are asked to talk in front of people whose language you don’t know very well, it’s hard to imagine how you can suddenly get the physical symptoms of palpitations, feeling short of breath, blushing and sweating. If your audience are sympathetic and praise you for your effort (and it is a huge effort) then you will feel motivated to try some more, so you can learn basic phrases and vocabulary very quickly. However, children and adults who are shy get these symptoms all the time when they are speaking in public. Children who are shy are much more aware than other children of the reaction that they get from adults, and particularly reactions about what the children do and how they talk. If they feel that they are being put on the spot; e.g. by being asked to contribute in Circle Time or answer their name at register time, then they can burn with embarrassment. A more confident child will not mind in the least, and will be happy to have a go at talking – whether they make mistakes or not. A shy bilingual learner will be much more focused on getting what they say 100% right. It’s very difficult to speak accurately at the best of times, and well-nigh impossible if you are learning a new language, so shy children often can’t say anything. As a result they may remain in the silent phase for a lot longer than other children, and not get the practice at talking in their new language. So what to do? For me, one of the answers is to involve the children in lots of singing. It’s also helpful to involve them in individual or very small group sessions where you can practice key phrases and translate them into the child’s home language. Sharing a book with a shy child is usually the perfect way to gain their confidence and increase their understanding, and particularly if it’s a book about a subject that they are already familiar with; e.g. Disney Princesses, trains or a familiar story. That way you will get a great deal of understanding, and will be more likely to hear the child have a go at talking. Here’s something we’ve started doing do on my ‘Developing Confident Talkers in Early years’ courses, where we think about how to help children who may be stuck in the silent phase. We are looking at how children search for meaning; picking out key words and phrases and how we can help them by translating these phrases. 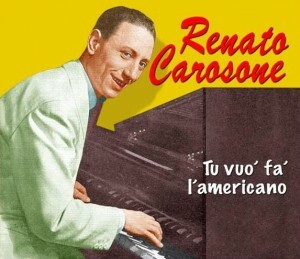 Watch and listen to Neapolitan swing/jazz star Renato Carosone in a very funny film clip, singing in Neapolitan. After you’ve finished laughing at the mandolin player’s dancing and the drummer’s facial expressions, were there any words or phrases in English that you could pick out? Maybe you heard I love you/ okay/ baseball/ rock ‘n’ roll/ whisky and soda? Now listen to Yolanda be Cool. After you’ve stopped laughing, I imagine that the tune will be well and truly (and quiet annoyingly) stuck in your head. Did you hear a phrase that sounded like Ba Ba Americano? It’s not exactly what they were meaning, but you’ll probably hear yourself singing it! Now watch the lovely Sophia Loren singing the song, and we can hear that Ba Ba Americano actually means You want to be Americano. Now we are getting somewhere. All you need now is for a nice teacher like me to sit with you and a few other friends and get you to listen out for what is really being said; i.e Tu Vuò Fa’ Americano. Hey presto! (or oplà!) you are on the way to knowing that tu in Neapolitan means you and Vuò means would like. And you won’t forget it! To treat yourself for working so hard, sit back and enjoy the rather cool and foxy Carosones performing their version of the song. Well done! Carosones. 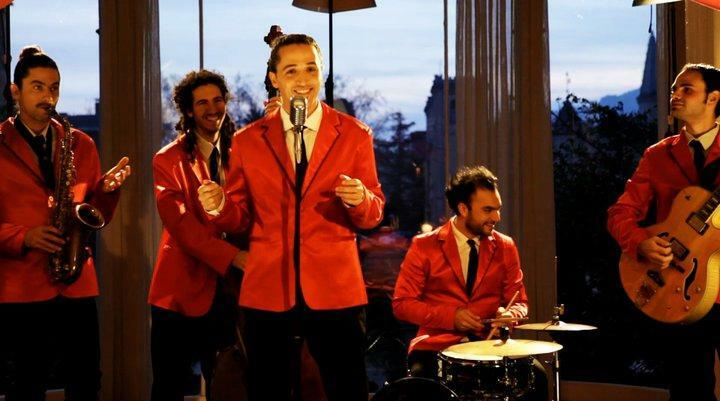 Who could imagine that a Neapolitan jazz/swing tribute band could be so cool!! There’s a lot more to language learning than singing and sharing books, but for young children who are feeling stressed because they have to do all their language learning in front of other people (i.e. any child in preschool or school) it’s an essential starting point. Many’s the bilingual child I have known who has benefitted from singing ‘The Wheels On the Bus’ regularly and then shared a book with an adult about buses, and particularly picture books that illustrate this and other popular songs. I always look forward to seeing that another of your entertaining posts has arrived in my in-box. For one thing, you are widening my musical experience, if not, it would appear, my tastes. One either responds positively to male Neapolitans with inexplicable Greek goddess buns, or one does not. But,the Bill Bailey Kraftwerk tribute; up there with those people playing “Smells Like Teen Spirit” extremely meaningfully on massed mandolins. I wonder if you’ve seen it? Hi Patricia! I’m glad you like the posts. I had to think twice about what you meant about men’s ‘buns’! I think Bill Bailey is just great, and I’m working on a post that will somehow justify me including him playing ‘Duelling Sitars’ with an Indian Bhangra band. I’m hoping that this will float your boat, but if you can’t wait then you can always Google it to check out some amazing playing.